Dental students from Plymouth University Peninsula School of Dentistry have worked with Year 10 students at Stoke Damerel Community College to raise their awareness of good oral health – and to consider a career in dentistry. The project began in November when the dental student team visited the College for an assembly. This was followed in January by a visit to the Devonport Dental Education Facility, where dental health students treat NHS patients under the supervision of qualified dental health care professionals as part of their studies. 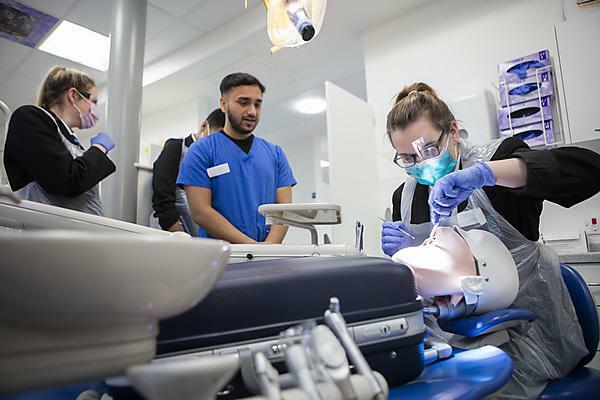 While there the Stoke Damerel students saw the clinical training bays, the simulated dental learning environment, the lecture theatre and the life sciences resource centre. They were able to ‘have a go’ at dental techniques using a mobile simulated dental resource and found out more about the various careers available in dentistry. The dental students will return to Stoke Damerel Community College in February to evaluate the impact of the project.